I was so over this day by 9:45am. William had an appointment at 8:00am, and I had to get both of the boys up, dressed, fed, and out the door by 7:40am. 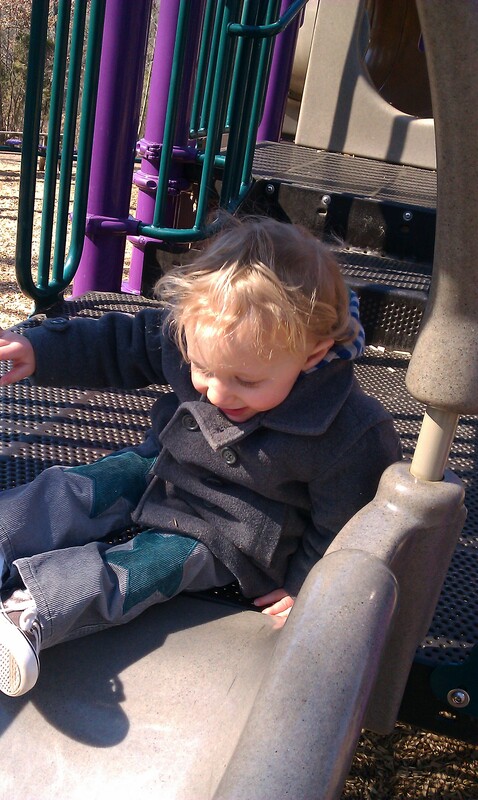 Once we arrived at the appointment, I had to stand outside on the nearby playground in near-freezing temperatures with Cormac for the half hour while we were waiting for William. Afterwards, despite my best efforts, there was a potty “incident” that forced me to drag both reluctant children back to the car and then drive all the way home to freshen up prior to getting back into the car so we could traipse to William’s new preschool and take care of some paperwork. As you can imagine, this was like trying to conduct a business transaction while holding two excitable monkeys by the ears. Last week I had the rare opportunity to meet up with my friend Katie and her son Lucas for a play date. In general, I have a lot of guilt issues because I don’t seem to be able to find people with whom I can do play dates or play groups or play armies or whatever. In truth, I read too many articles when I was pregnant about “Play Date Etiquette” and was scared off. It all sounded so tedious and impossible. Play dates with Katie are, however, a pleasure. Lucas and William are the same age and Katie and I so rarely get a chance to catch up. It seems like we can’t even exchange ten words without wiping a runny nose, pulling up pants or shouting at a child who is swinging from the chandelier, but at least we are not feeling like we missed out on proper play date etiquette. The other super thing about play dates with Katie is that she always makes some delectable treat for us – from scratch. I showed up this time all harried, dragging my two hyperactive boys, and she had stovetop oatmeal cooking and these amazing-looking pans of cinnamon rolls on the countertop. I’d have assumed they were frozen, but I saw her applying the sugar icing before my eyes.